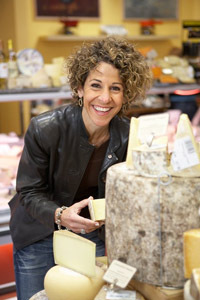 When you ask a cheese expert like Laura Werlin – a grilled cheese expert, no less – to share one of her favorite grilled cheese recipes, you gotta be ready for something pretty unbelievable. The James Beard award-winning author immediately suggested her Chips and Guacamole Grilled Cheese: smooth-melting Colby and Jack cheeses, dotted with tangy dabs of goat cheese, and layered with smoky bacon and fresh guacamole on tortilla chip-crusted sourdough bread. Un-be-lievable. I met Laura a year ago when we both served as Executive Judges for the Grilled Cheese Invitational (if you’re in the area, this year’s event will be held this Saturday, April 28, 2012 at the Rose Bowl in Pasadena, California). When she told me that her fifth book, Grilled Cheese, Please!, had just launched I knew she’d be a perfect guest to interview for Panini Happy. In our recent conversation, Laura shared her thoughts on the new wave of grilled cheese sandwiches, her tips for making the best grilled cheese and, of course, the recipe for that incredible chips and guac sandwich. With April being National Grilled Cheese Month I’ve seen all kinds of grilled cheese sandwiches lately – on blogs, Pinterest and at eateries. There appears to be a wide range of how people interpret grilled cheese. I was curious to know how you personally define grilled cheese. Is it cheese only? Mostly cheese? Only a little cheese required? Most of us have an image of a grilled cheese sandwich as just being oozy cheese, bread and butter. My definition of a grilled cheese sandwich is a sandwich where cheese is the star. It may have other ingredients that will prop the cheese up but won’t obscure it. You have to have a good quantity of cheese for that to be the case. Likewise, you probably want to have less of the other ingredients so that the cheese is never placed second-fiddle. Let’s talk about trends in grilled cheese. The use of pasta – such as the Grilled Cheese Truck’s Cheesy Mac and Rib – is one I’ve noticed. What other trends are you seeing? I think what you’re seeing is that anything goes. We’ve seen it at the Grilled Cheese Invitational and you’re seeing it in mobile trucks and places that sell grilled cheese. It can be everything from including marshmallows to, as you said, pasta. There’s also a lot of meat. That’s where the definition of grilled cheese gets a little dicey. It might be short ribs and cheese but the question is, which gets top billing? And there’s not necessarily an answer to that, it depends on how it’s made. You didn’t see the more exotic cheeses being used on grilled cheese a few years ago. It was originally meant to be sort of cheap and comfort food, not gourmet. Now it’s becoming kind of high-fallutin’. You might even find a variation on a grilled cheese in a higher end restaurant. It won’t be the main course but it might be something that accompanies a soup or something like that. And it might be truffled cheese. Would you share with us a few of your best grilled cheese-making tips? It’s essential to grate the cheese rather than slice it, and that’s because it will melt quicker. Very often if you put a grilled cheese sandwich in the pan with cheese that’s too thick the bread will burn before the cheese has a chance to melt. That is unless you have it at a very low heat, but then you’re waiting twenty minutes for your sandwich and who wants to wait twenty minutes for a grilled cheese sandwich? You also want to butter the bread, not the pan. That means you need to have your butter at room temperature. If you put the butter in the pan then the minute you put the sandwich in the pan the bread acts like a sponge and absorbs the butter. You end up having to add a lot more. Plus, by spreading butter on the bread it’s an even coating of the butter rather than splotchy. Well, unless you’re putting a half a stick of butter in the pan, in which case you’re deep-frying. It’s best to butter the bread. Along those lines, I firmly believe in using salted rather than unsalted butter. Even though there’s certainly salt in whatever is on the inside of the sandwich, including the cheese, I feel like you get more flavor overall by seasoning the bread, in effect. At the chain, The Melt, one of the interesting things they do is, after the sandwich is cooked, they sprinkle it with their house seasoning. Finally, I really like to use a nonstick pan with a lid for grilled cheese. Or a really well seasoned cast iron pan, that works too. Otherwise I feel like the nonstick pans cook the most evenly and, of course, they allow you to scrape up those little bits of cheese that have inevitably oozed out. You can just scrape them up easily and eat them. I prefer a pan with a lid because you want to cover the sandwich for the first two-thirds of cooking it. By covering it, once again you’re expediting the melting of the cheese before the bread has a chance to burn. People say, “Isn’t the sandwich going to get steamed rather than crisped if you do that?” The answer is “no” because the contact between the sandwich and the pan is enough to crisp up the sides. What you do is cover it for the first two or three minutes of cooking, flip it and cover it again to get the cheese thoroughly melted and all of the ingredients on the inside heated through. Then you flip it again and keep the lid off for the last thirty seconds or so and give it a good firm press. 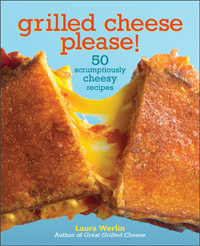 Lastly, what is your all-time favorite grilled cheese sandwich? Oh my gosh, that would be like asking me to choose a favorite child. Double Cheddar and Tomato Jam and Chips and Guacamole Grilled Cheese (NOTE: you can find the recipe at the end of this post) are certainly some of my favorites. Honestly, I really do think that less is more in life – and that also includes with grilled cheese sandwiches. So I am very, very happy if I have the perfect ratio of bread to cheese and that bread and that cheese is good…really good. 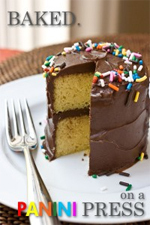 And it’s made with really good butter – by the way, Kerrygold butter is my butter of choice, I love the stuff. Those three things, to me that’s perfection. Grilled cheese, at its most basic, might also be its most satisfying. Thanks so much to Laura for all of her fabulous insights AND for making us all insanely hungry for grilled cheese right about now! Her recipe for Chips and Guacamole Grilled Cheese is below. What a phenomenal sandwich. You get this amazing whiff of tortilla chips as you bite through the crunchy crust. The Jack and Colby cheeses are milder, but are really smooth melters. The goat cheese adds little tangy punches throughout. 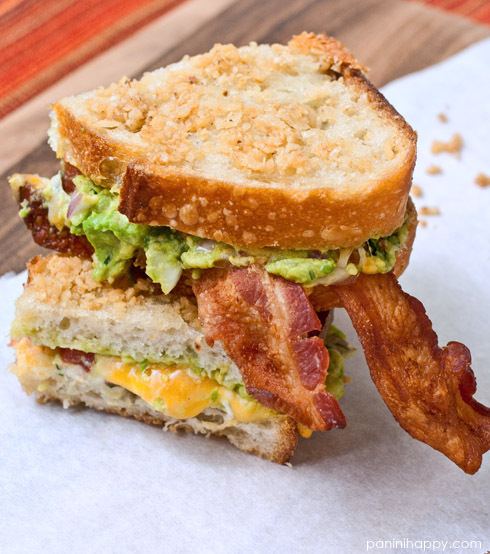 Guacamole on a grilled cheese sandwich could turn mushy, but the presence of the crispy bacon deftly combats that issue (and also adds wonderful smoky flavor). Line a plate with paper towels. In a large nonstick skillet, cook the bacon over medium heat until very crisp. Drain the bacon on the paper towels. Remove the bacon fat from the pan and wipe the pan with a paper towel, but do not wash it. Set aside. To make the tortilla chip butter, put the chips in the bowl of a food processor and process until the texture is very fine, similar to sand. Alternatively, place the chips in a sturdy plastic bag. 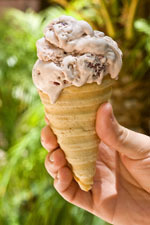 Using a meat mallet or other heavy object, pound the chips until they are the texture of sand. Put the butter in a medium bowl and add the ground chips. Using a fork, work the chip “sand” and butter together until well mixed. The mixture will be somewhat stiff. To assemble: Spread the butter mixture on one side of each slice of bread. Place 4 slices, butter-chip mixture side down, on your work surface. 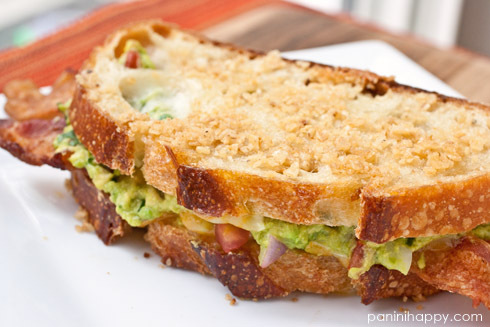 Spread 2 tablespoons of the guacamole on each slice of bread. Sprinkle the tomato on top of the guacamole, if using. Follow with the Colby and Monterey Jack cheeses. Dot with small pieces of the goat cheese. Finish by placing two bacon pieces on each sandwich. Top with remaining bread slices, buttered side up. For stovetop method: Heat a large nonstick skillet over medium heat for 2 minutes. Put the sandwiches into the pan, cover, and cook for 3 to 4 minutes, until the undersides are golden brown. Watch carefully because the chips in the butter can burn easily. Turn the sandwiches, pressing each one firmly with a spatula to compress the filling slightly. Cover and cook for 2 to 3 minutes or until the undersides are well browned. Turn the sandwiches once more, press firmly with the spatula again, cook for 1 minute, and remove from the pan. Let cool 5 minutes. Cut in half and serve. For sandwich maker method: Use your sandwich maker for this sandwich only if you have variable heat settings. Otherwise, it will cook too hot and burn the chips on the bread without melting the cheese. To use your sandwich maker, follow directions for assembly above. Cook according to manufacturer’s instructions. These are such fabulous tips, Kathy. Thank you for sharing Laura! I am such a fan of grilled cheese and putting chips on this on is over-the-top brilliant. I love it! I have that book and it’s great! Fun post! I was fine with the lunch I just ate until I read this. This sounds like everything wonderful in a sandwich. I think this is on the horizon with all these great avocado prices around right now! I know what you mean – I got so hungry just talking to Laura! And you’re so right about the avocado prices…I checked my receipt yesterday and saw I paid just 50 cents for a perfect avocado. That sandwich looks incredible! And what a cool, informative post. I love it. Previous post: Rajas Grilled Cheese Panini + Tillamook Cheese Giveaway! Next post: Grilled Jarlsberg with Shaved Asparagus and Arugula Pesto + Grilled Cheese Kit Giveaway!